Who is Liable for Rear-End Collisions in California? 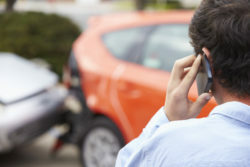 Rear-end car accidents are most often caused by one driver following too closely and failing to break when appropriate, but there are a number of different situations in which the driver being rear-ended is actually at fault. Each accident situation is unique, so it’s important to evaluate your individual circumstances before making an assumption about liability. As noted above, a large percentage of rear-end collisions are usually caused by the vehicle following the other. If you are following too closely behind another car in an effort to make them speed up, then your behavior may be considered negligent when you make impact with the car in front of you. Courts also consider failing to stop in a reasonable amount of time, failing to drive at a proper speed and neglecting to pay attention to break lights a breach of a driver’s responsibility to drive carefully. In other situations, car accidents involving a rear-end collision may be caused by the driver who is hit. These accidents often involve unexpected breaking, inoperable break lights, a sudden reversal or other malfunctioning car parts. In these situations, it’s likely that the driver who is hit will also take on the legal liability for any property damage or personal injuries. If you’ve been involved in a rear-end collision, then don’t assume the fault will be placed on the driver following the car that is hit. This is not always the case. Enlisting the help of our car accident attorneys can help you prove who was at fault and who will be financially responsible for any medical bills, property damage or missed time from work. Reach out to The Paris Firm using our online contact form.